Over the past several years, mild weather and surging domestic production of natural gas and propane have muted the seasonal effects of the winter heating season–the period of peak demand for both of these thermal fuels. But the 2013-14 winter has served as a reminder that extended periods of frigid temperatures can still exert a pronounced effect on these commodity markets. However, investors shouldn’t mistake this seasonal surge in propane and natural-gas prices for a durable rally; the underlying supply and demand trends that prevailed before the Polar Vortex are still in play. 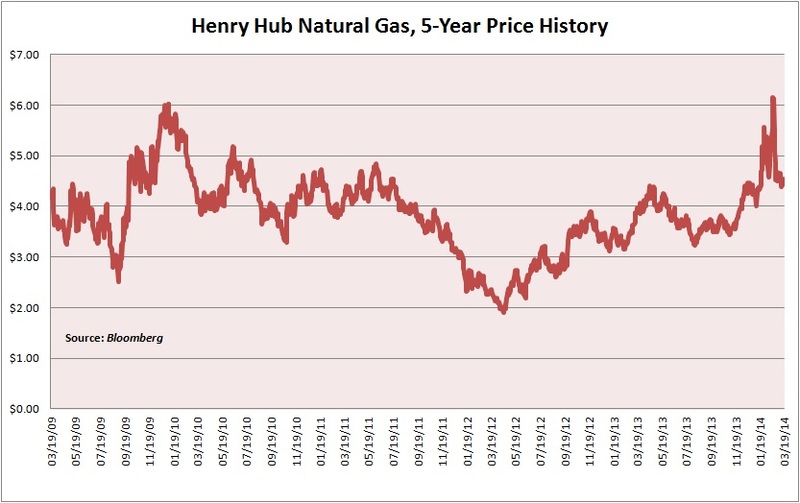 The front-month price of natural gas at Louisiana’s Henry Hub–the official delivery point for the volumes underpinning the futures contracts traded on the New York Mercantile Exchange–surged to more than $6.00 per million British thermal units (mmBtu) this winter. And natural-gas prices in parts of the Northeast that were hardest hit by the cold have surged even higher. 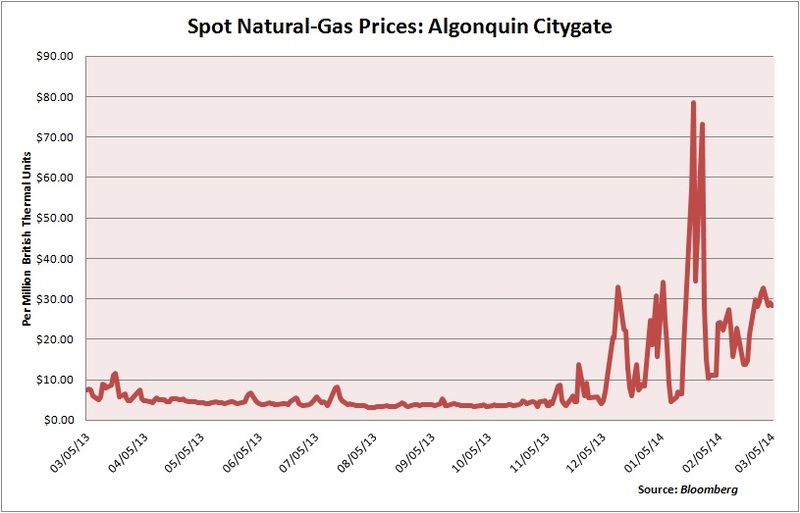 Check out this graph tracking spot natural-gas prices at the Algonquin Citygate hub serving Boston. However, investors shouldn’t confuse this seasonal rally with a durable recovery in natural-gas prices. All this recent upside stems from weather-related phenomena, not newfound discipline on the supply side or sustainable demand growth. As my colleague Elliott Gue discussed in It’s Cold Outside: Buy the Dips, the big chill that gripped the nation in January disrupted all manner of economic activity. Snowstorms and plummeting temperatures combined to send the Institute for Supply Management’s Purchasing Managers Index for the US manufacturing sector plummeting to 51.3 in January from 56.5 in December 2013. To ward off the cold, households and businesses have fired up their heaters; robust demand for thermal fuel has reduced the volume of working natural gas in storage to levels that are 38 percent less than the seasonal average. 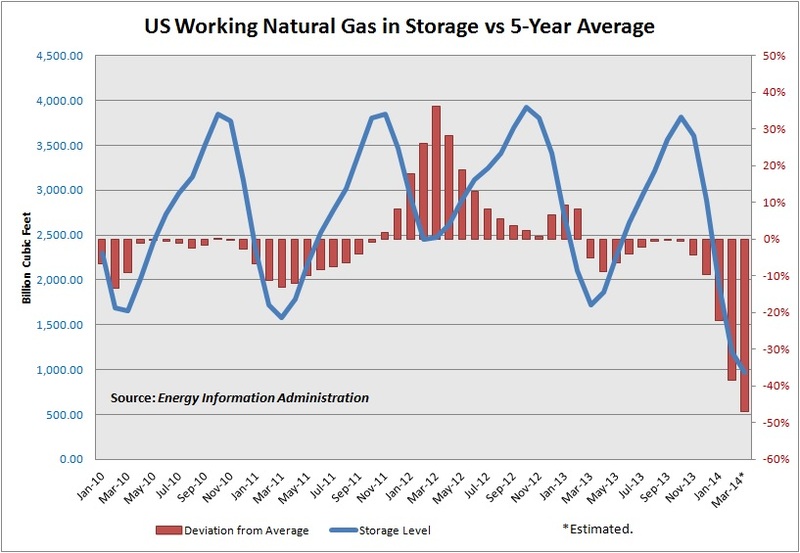 And frigid temperatures in February prompted the US Energy Information Administration to project that the volume of working natural gas in storage would slip to less than 1 trillion cubic feet in March—the lowest level since 2003. Meanwhile, frigid temperatures have led to wellhead freeze-offs, problems at natural-gas processing plants and general operating difficulties in some of the nation’s most prolific shale oil and gas plays. The challenges caused by the cold weather show up in LCI Insights’ estimates of weekly US natural-gas production; output dipped at the end of December and didn’t recover fully until temperatures moderated toward the end of February. 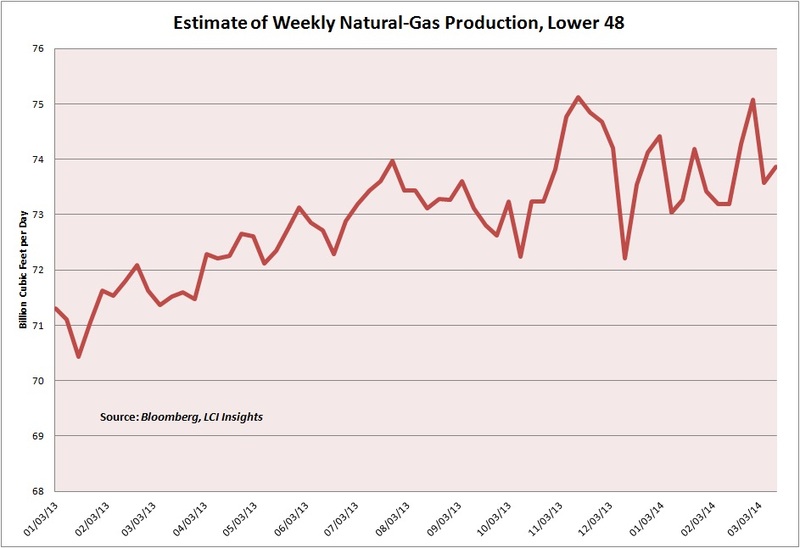 But the tightest natural-gas market in more than a decade won’t last. Recall the no-show winter of 2011-12, when natural-gas prices plummeted to less than $2.00 per mmBtu because of weak heating demand. In that instance, ultra-depressed fuel prices spurred coal-to-gas switching among electric utilities with the flexibility to burn either thermal fuel; coupled with a normal winter in 2012-13, this incremental consumption eventually returned the market to equilibrium. And as natural-gas prices recovered from ultra-depressed to depressed levels, utilities reverted to burning coal to take advantage of superior economics. This gas-to-coal switching explains why US utilities’ consumption of natural gas tumbled to 22 billion cubic feet per day in 2013 from 26 billion cubic feet per day in 2012. The start-up of new midstream capacity–gathering lines, processing facilities and pipelines–in the prolific Marcellus Shale (about 18 percent of US natural-gas production last year) and the emerging Utica Shale should help to refill storage capacity before the 2014-15 winter. The futures market reinforces that the recent upsurge in natural-gas prices, though impressive, won’t have staying power. The red line on this graph tracks US natural-gas futures prices one year ago, while the blue line tracks represents the current futures curve. 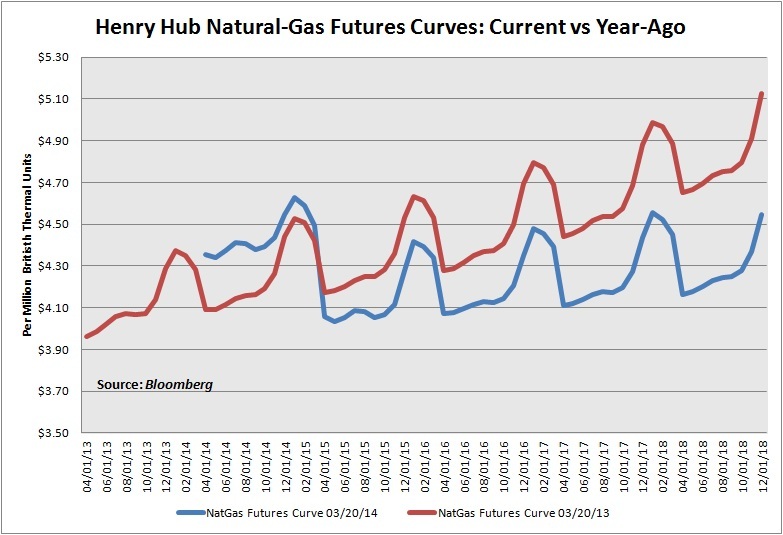 Although the price of natural gas for delivery over the next 12 months has increased from year-ago levels, futures prices beyond March 2015 have declined. In other words, market participants expect the weather-induced strength in US natural-gas prices to fade over the summer and prices to return to the neighborhood of $4.00 per mmBtu by early 2015. This retrenchment might occur even faster, as the current price environment could tempt long-suffering gas producers to accelerate their drilling and completion activity this summer. 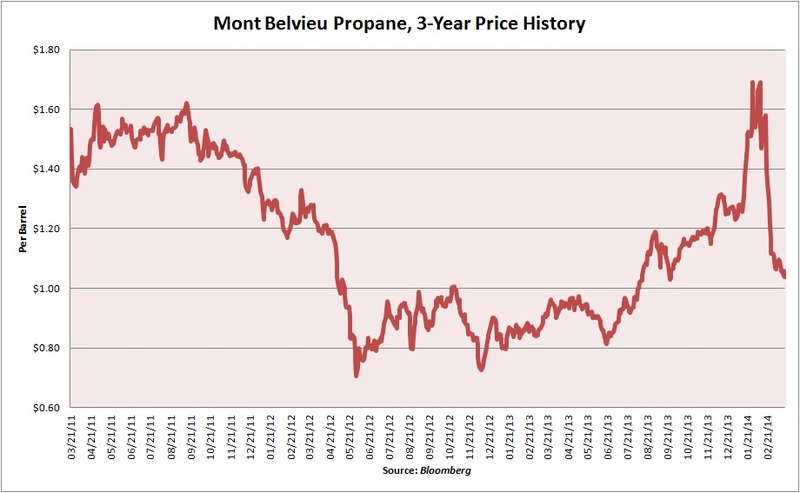 The price of propane, which can be used as a petrochemical feedstock and a heating fuel, plummeted after the unseasonably warm 2011-12 winter sapped demand and pushed inventories to a record high. 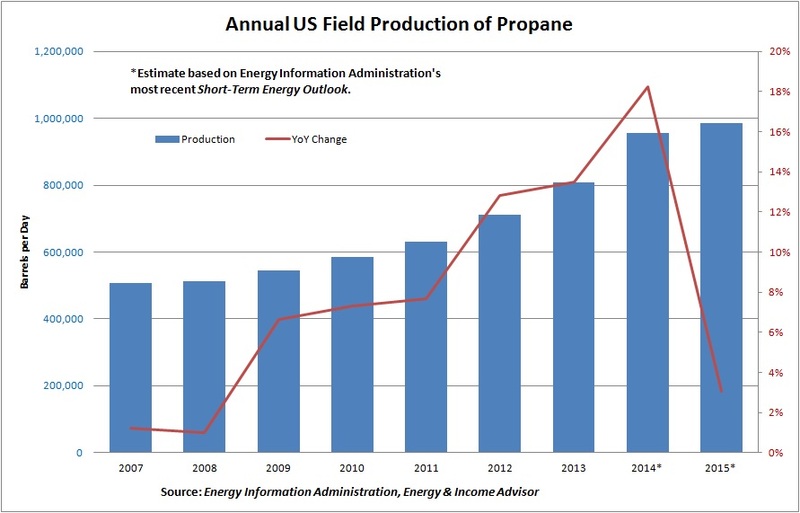 But propane prices improved significantly since the end of the second quarter, thanks to a normal 2012-13 winter that helped to reduce US propane inventories and rising seaborne exports of propane and propylene that provided a release valve for rapidly growing production. 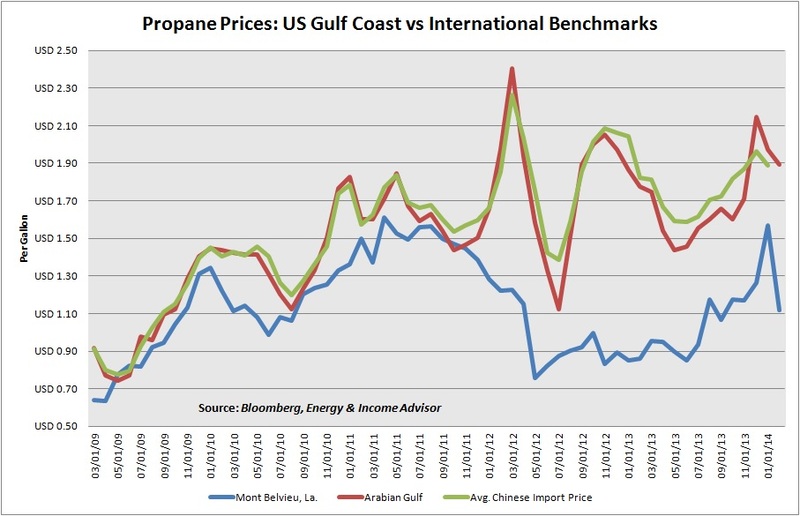 This upsurge in exports reflects the intersection of several trends, including favorable US propane prices relative to international benchmarks, expanding export capacity on the Gulf Coast and robust demand growth for seaborne cargos in emerging markets. More recently, US propane prices surged because of a confluence of weather-related factors and shifting product flows. The largest US corn crop in history and a wet growing season dramatically increased demand for this natural gas liquid in the Midwest, depleting inventories by about 20 percent relative to year-ago levels. Farmers use propane to reduce the moisture content in their corn, a necessary practice to prevent mold and spoilage during storage. With increasing volumes of propane heading to the Gulf Coast for export and frigid temperatures bolstering demand for the heating oil and depleting inventories, propane prices popped to record levels. This surge was particularly pronounced at the hub in Conway, Kan., where prices soared to more than $4.00 per gallon in late January and early February. 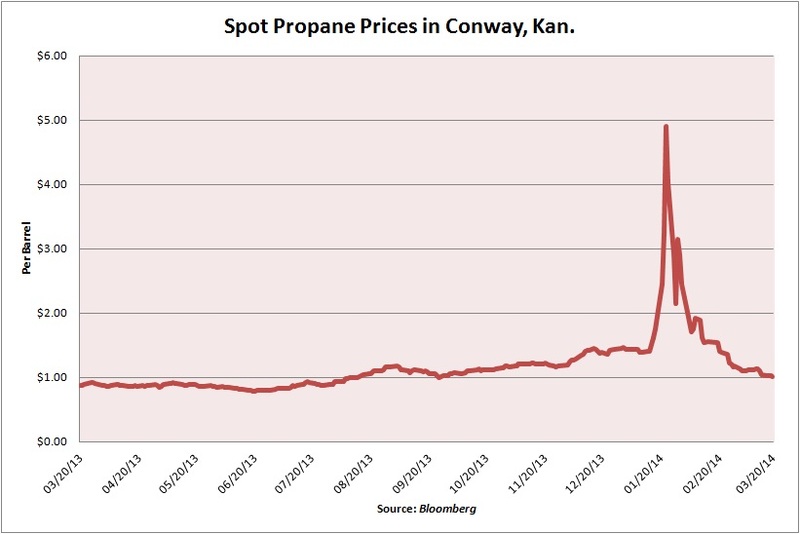 In recent weeks, propane prices at Conway and the Gulf Coast have pulled back significantly, reflecting reduced domestic demand as the weather improves. 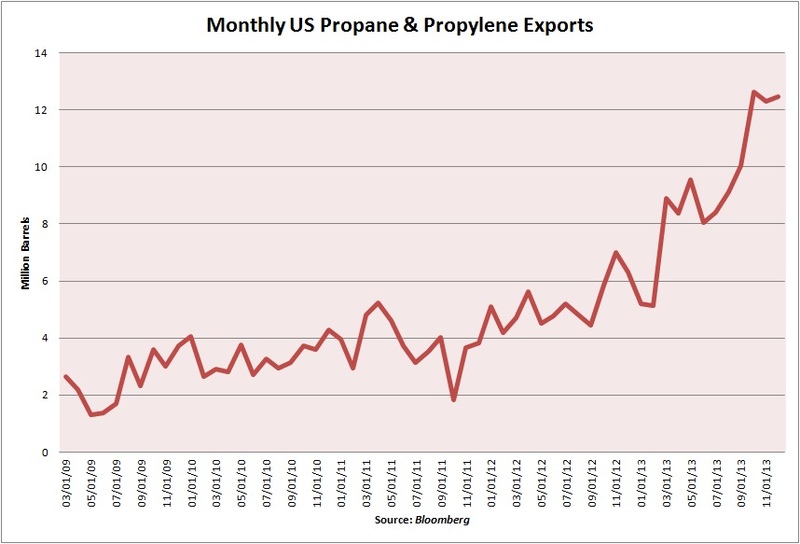 Growing US propane production has depressed the domestic price of this commodity, widening the spread relative to international markets and prompting leading midstream operators to develop export facilities to meet robust demand for seaborne exports. 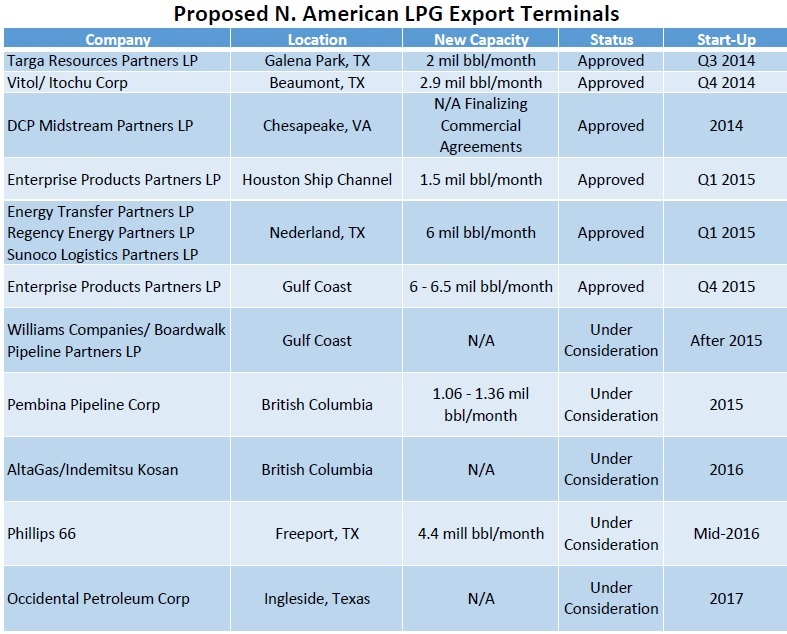 With a total loading capacity of 7.5 million barrels of propane and butane per month, Enterprise Products Partners LP’s (NYSE: EPD) terminal on the Houston Ship Channel dominates the North American export market. Targa Resources Partners LP (NYSE: NGLS), another early entrant in this market, owns and operates the Galena Park terminal, which can load between 3.5 and 4 million barrels of liquefied petroleum gas a month. This capacity will increase to 5.5 million to 6 million barrels per month after the master limited partnership (MLP) completes an expansion project in the third quarter of next year. Sunoco Logistics Partners LP (NYSE: SXL) also exports propane produced in the Marcellus Shale from its Marcus Hook terminal in eastern Pennsylvania; volumes shipped from this site should pick up this year, when the first phase of the Mariner East pipeline comes onstream. A number of master limited partnerships and other energy companies have followed these early entrants, announcing their own export projects. Although we don’t expect all of these schemes to move forward, the amount of planned export capacity should help to ensure that the market remains in balance when additional supplies from pipelines and fractionators arrive in the Gulf Coast. Ultimately, we expect US propane prices to move closer to international benchmarks–minus transportation costs. The struggles that mom-and-pop propane distributors faced to supply customers this winter likely will accelerate ongoing consolidation in this highly fragmented industry. AmeriGas Partners LP (NYSE: APU), which sports a distribution yield of about 8.15 percent, offers exposure to this trend and should generate steady returns for investors. However, our favorite play on this trend owns significant dock space on the Gulf Coast and has reaped the rewards of working with Enterprise Products Partners to build the nation’s largest export terminal for propane and butane. This MLP earns volume-based throughput fees on these shipments and a share in the margin received on every customer vessels loaded at the Houston Terminal. In addition to this partnership with the leading US propane exporter, our favorite MLP owns significant storage capacity on the Houston Ship Channel and in Beaumont, Texas, and has ample opportunity to expand these facilities to take advantage of robust customer demand. This MLP’s stock has generated a total return of almost 50 percent since we added the stock to our Conservative Portfolio in September 2013–and we see more upside to come. 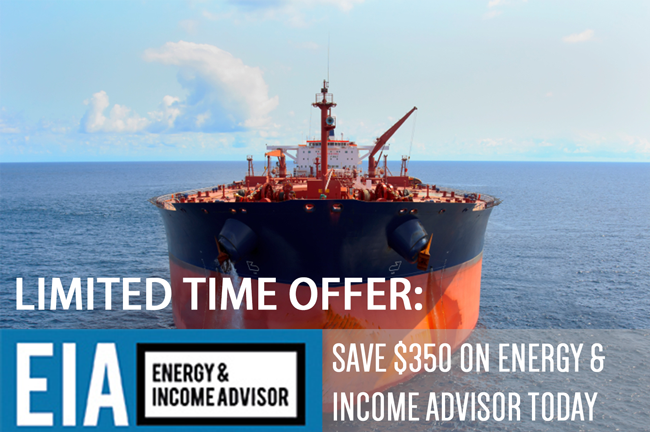 Subscribe to Energy & Income Advisor today and you’ll get instant access to our top play on US energy exports and all the other winners in our Aggressive and Conservative Portfolios.